Gum disease, periodontitis, is a disease process which destroys the supporting tissues of the tooth, the gum and the bone. If you are diagnosed with gum disease, it means you have pockets, spaces between the gum and the bone, of more than 3mm. Pockets of 4-5mm indicate a severe periodontitis, pockets of 6mm or more will probably lead to tooth loss. After the initial assessment the teeth will be thoroughly cleaned, if necessary using local anaesthetic, with an ultrasonic scaler. It might not be possible to complete this in one visit, in severe cases we might need 4 visits for the initial cleaning! The teeth are then polished using a high pressure salt and water spray, and oral hygiene measures are demonstrated. The next visit will be scheduled 1 – 3 months later, depending on the severity of the problem, where any remaining hard deposits will be identified (under magnification) and the polishing repeated, and hygiene instructions reinforced. Further visits are scheduled every 3 months. Home care is, however, the most important part of continued periodontal therapy; we search for areas where hygiene is more of a challenge, and assist you in identifying these areas, to reinforce your home care. 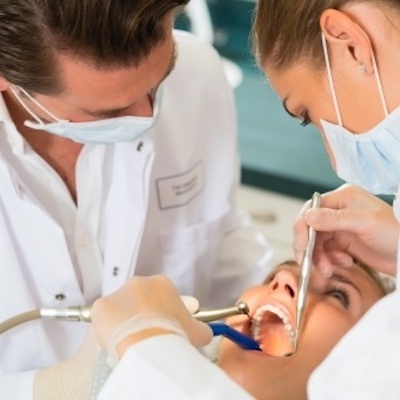 Very rarely will corrective surgery be suggested, but problem restorations such as overhanging fillings or overhanging crowns may have to be adjusted or replaced. Our aim is to create a healthy, easily maintainable mouth, to enable you to keep gum disease away!